The text summarizes and reflects upon the outcomes of a broadly comparative research project of the Centre for Advanced Study in Sofia entitled We, the People: Visions of National Peculiarity and Political Modernities in Southeastern Europe. The project, and the resulting collective publication We, the People. Politics of National Peculiarity in Southeastern Europe (ed. Diana Mishkova; New York and Budapest: CEU Press, 2009), explore the political instrumentalization of key concepts describing collective identity, such as nation, folk, people, ethnos, national tradition, race, etc., with the purpose of “mapping” the discursive and institutional itineraries through which this set of notions became a focal point of cultural and political thought in various Southeast-European contexts, coincidental with the emergence of political modernity. The paper is focused on one of the founding fathers of contemporary critical theory of history. Hayden White’s metahistory is interpreted as a project of turning literary theory into protocol for studying historiography without falling into the traps that positivist and analytical philosophers of history fell into in the 1960s. The paper discusses the limitations of that protocol, the traps it also fell into in the 1980s, and the promise of the discursive analysis of historical writing to find a way to overcome those traps stemming from the textual focus of literary theory. This paper examines the relevance of Foucault’s later works to the field of historical sociology of socialism. First it deals with his reflections on genealogy as a specific methodological approach, on governmentality as a form of modern political rationality, and on processes of subject formation, in order to situate Foucault’s views in the broad domain of historical sociology vis-à-vis some of its major topics such as the genesis of the modern power, state and institutions. Foucault, it is argued, brings an essential novelty in that field, by making a non-institutional analysis of power relations. Thus we are able to see the general technology of power proper to a given strategic historical situation. In the second place, the paper sketches the main points of the debate between the so called “totalitarian” and “revisionist” paradigms in the history of the socialist period in order to show the methodological advantages of the lаtter. It is precisely the multidimensionality of the “revisionist” paradigm that opens up the possibility of practicing a Foucauldian historical sociology of socialism, by broadening the notions of power and resistance exercised in the socialist societies. Finally the emphasis is put on the processes of subject formation as one of the latest developments of the Foucauldian approach towards socialism; three key studies are discussed in order to illustrate it. The proposed text combines philosophical-anthropological approach with cultural studies analysis of a supposedly exotic and fascinating topic as the one about cannibals. The author follows the plot how the discovery of America by Columbus and his followers challenges the social prejudices and mental pictures of the Europeans towards a Newfound Land, which in a short period becomes a symbol of the radical Difference, of an existence beyond the boundary of the social perception. After the collapse of the identification of the New World with a part of Eden, a new negative identification appeared – the Europeans imagined this New World as a radically different, as a land of horror, sickness, hostility. Part of this process is the demonization of the indigenous population in the gradually built notion of cannibalism. The text explores exactly this social construction of the image of the Cannibal in the 16th and 17th centuries. The article poses the problem of the missing Bulgarian chronicles during the Middle-ages. It traces the literary appearances of historical consciousness in different parts of Bulgarian history between the 7th and 15th century. The conclusion reached is that the old-Bulgarian historiography is a sign of consecutive, although maybe unconscious refusal of objective reflection of the ongoing events. The created texts are an attempt of recreation of history in relation to some ideal image of the past, which is usually (or should be) used as an argument in the aspirations towards political and ethnical autonomy. The text deals with the problematic autonomy of the field of historiography and that of literature in Bulgarian culture after World War I, and their institutional impossibility to deliver different concepts and different narratives on the topic of Bulgarian history. In the interwar period, the different fields – at the level of their subjects – were pressed together by the institutions in the point of “the national ideal” and “national unification”. In the Stalinist communist period after 1944 – at the level of their scientific methods – they were pressed together by the institutions in the point of the “Marx-Leninist philosophy” and, in general the political doctrine of the time. After the Stalinist period (the 1970s and 1980s) the same occurred in the point of “ethno psychology”. The main role of the state in those different political contexts was to ultimately institutionalize that impossibility. The paper describes the unique destiny of a man, who was a living incarnation of the totalitarian cultural power – the Marxist professor, regent of Bulgaria, the maninstitution Todor Pavlov – together with his role for the stabilization of the Bulgarian literary canon. In the beginning the paper depicts his early vicissitudes in constructing the idea of “Bulgarian literary classics” and of the institutions maintaining it – the first period of suffering its civilizational absence and the efforts to fill it up and the second period of struggles to officialize it and alternative projects. Special place is devoted to the cultural policies of the Bulgarian left wing during the period 1880–1935-6 when it contests the “bourgeois classics” and tries to construct its own alternative tradition. Todor Pavlov, initially a part of this leftist policy, gets into the USSR during the most Stalinist years (1932–1937) and turns there into an international authority on philosophy, aesthetics, art theory and history and literary criticism. Having taken up this position, in the late 1930s and early 1940s in Bulgaria he manages to construct a new and paradoxical, leftist-national canon including (by means of a dialectical Aufhebung) the most important and previously repudiated bourgeois authors. After the World War II under the conditions of communists gradually seizing the state institutions Todor Pavlov manages (through a combination of organizational, terrorist, festal, political-instructive and rhetorical means) to mould a stable notion of Bulgarian classics that rapidly turned into institutionalized reality of the Bulgarian literature still valid today. 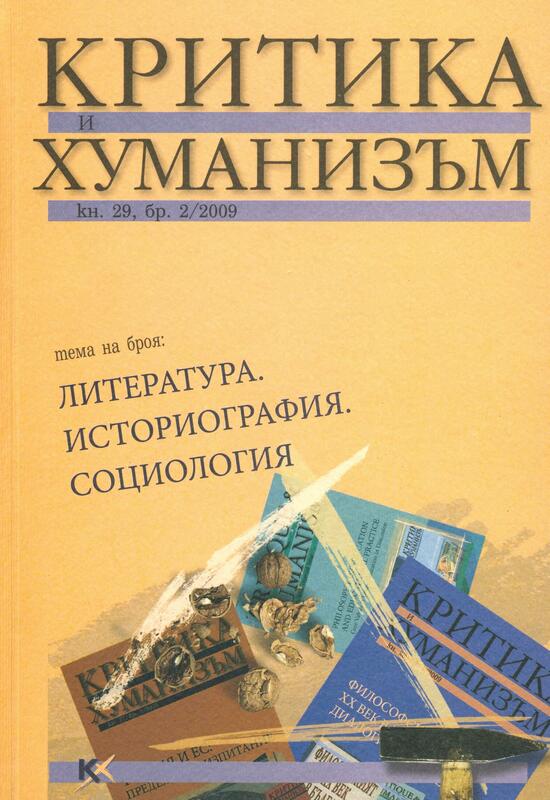 The paper is a sociological analysis of the several key elements that constitute the specific historical profile of Bulgarian criminal law in the period of transition to socialist society: the total codification of the social danger of crime; the ‘practical necessity’ of the application of ‘law by analogy’; the political function of the legal circumstance; the constitution of the concept of guilt: counter-revolutionary mens rea; the double social role of punishment. The central thesis is that punishment in socialist society exercises a generalized function irreducible to its legal regulation nor to its institutional juridical execution, nor to the regime of imprisonment. In the centre of the penal system of the socialist society, there is the labour-corrective impact on its unstable members, and the final aim – their overall transformation and gradual creation of a new socialist personality. Seven scientific journals of the times of socialism are considered as documentary evidence and as conflict places of memory for the researchers of communism. The theme through which they are read is the double turn that began in the 1960s in the West and in Bulgaria – in the practices of consumption, and in the accumulation of knowledge on consumption. A description is provided of how the social scientists themselves, in those times, define the problem(s) of socialist consumption and of the ‘society of consumption’ – in what terms, in what contexts, what names were given to the emerging consumer attitudes in an ‘economy of shortage’, in an ‘ideological society’ whose peculiarity is the immanent contradiction between utopian-ideological and modernizational tasks. The hypothesis is that some of the actual contradictions of the promise of ‘harmonious consumption’ were grasped by the professional researchers at the time in the very process of their deployment. One of the theses is that the failure of the project of specific socialist consumption and ‘wealth of man’ cannot be accounted for solely and automatically by the failure of the primarily contradictory ‘logic of the Plan’. The ‘empirically’ interwoven relations are shown between personal memories, ‘disciplinary memory’ and history. The text deals with the non-realized state projects in the field of culture at “the time of Ljudmila Zhivkova”. Tracing the documentary and archival domains, the author investigates seven projects of the Committee of Culture chaired by Zhivkova in the 1975-1981 period, projects which never came into practice: the House of the Art Unions for Aesthetic Education; the National Spiritual Centre of Bulgarian Culture; the Audiovisual Centre of World Cultures; The Pantheon of the Bulgarian State; The Himalayan “Urusvati” Institute; The Yogi Union; and the University for special education in culture. The text comments the public scandal that flared up in 2007 and involved a lot of high officials and statesmen. The scandal in question was related to a research project, investigating the place of one Bulgarian town – Batak – in the national memory. The paper argues that the scandal with the so called “Batak myth” project was a symptom of crises in three important institutional fields – that of the Bulgarian nation state, that of the media, and that of the field of social science. The analysis shows the substitution for the specific logic of functioning of those three fields of other ones: the notion of nation state is replaced by nationalistic rhetoric – due to the fact that nobody believes in the Bulgarian state, but everybody wants to be proud of his/her national identity the disappearance of the state is covered by glorifying the nation; the crisis in the media critical publicity is hidden by apologetics of national causes; the (low) prestige of social sciences is “safeguarded” by the substitution of mass consciousness attitudes for scientific arguments. This focus on national identity as the only “fortress” of “our glorified past” could be dangerous in the situation of still ongoing state institutions crisis, because it may totally replace the civic identity of our nation by monoethnic one, and this could lead to undermining some key democratic values. The article deals with the historically-oriented attitudes towards the sphere of social life of literature, proposed by Janusz Sławiński. An account is given of problems concerned with the subject, goals and cognitive limits of the sociology of literature. Endeavoring to summarize the recent development of the discipline, the author examines Pierre Bourdieu’s contributions such as cultural, social, and symbolic capital, and the concepts of habitus, field or location, and symbolic violence. The New Historicism grounded in the reactions of “everyday life-readers” and implying that literature must be studied and interpreted within the context of both the history of the author and the history of the critic, is particularly emphasized. What does happen when we substitute the “generations” with “constructed identities”? Is it possible to draw a clear borderline between the identical biographical experience, the common cultural-historical background and the collective representations of a given social group? What kind of social cohesion and solidarity do the kinship metaphors articulate? How could we overcome the “routine” and inertia of the classical sociological and historical models? In trying to answer these questions the present article discusses the “problem of generations” in the terms of the social constructivism, the conception of social time and the identity theory. The Mannheim’s heritage is analyzed as a valuable epistemological basis for binding together the “semantic orders” of the culture circles (Michael Korsten) with “the places of memory” and “the centres of collective experience” (Pierre Nora). The main thesis is that the “generations” could be examined as public discourses and hronopolitics, which temporalize certain group ideologies and vice versa attach ideological meanings to different time units. The research object is the social scene of Sofia, the Bulgarian capital, in the 1920s. In 1910 Sofia population was 103 thousand people, in 1920 it grew up to 156 thousand, and in 1926 it reached 213 thousand. That resulted in huge acceleration of the city periphery and entailed a particular bottom-top strategy of urbanization markedly demonstrated by the fact that in 1920 53.4% of the families lived either in one single room, or in a room and a kitchen, or in two rooms without kitchen; 4048 families were sharing their single bedroom with another family and for the half of the population the average number of persons sleeping in one bedroom exceeded 4. 25 newcomers per day were heading the city from places they knew they could not return ever; they were here to stay. And what this meant was to find their place on the social map and within the moral space at the very same time when the social map and the moral space were turbulently changing. And to find one’s place on the rapidly changing social map and in the anomic moral space means to partake in the elaboration of normative vocabularies consisting of categories with all at once evaluative and descriptive functions that would give this world a little bit more inhabitable outlook, that is, categories by which to can tell one’s life story as a story not missing dignity and by which to can bind one’s life story to some collective categories of identity and endorse it with some temporal dimension. What were these categories? What were the resources for them? Where did they come from? What discursive and non-discursive practices they served and how? What battles they armed and what horizons of activity not known before the new vocabularies came into being they opened up? And what the solder-citizen, the crook and the proletarian pale son have to do with all that? The article aims to present and comment the main issues and the aesthetic orientation of the French literary magazine L’Atelier du roman. The analysis is focused on the place of the novel among the other literary genres as well as on the specificities of the research of the world proper to the novel. The theses of the analyses are supported by two translations from the magazine. The first one – Milan Kundera’s Fragments – delimitates the knowledge of the world carried by novel from the sociological knowledge of the world. The second one – Benoît Duteurtre’s Les Cent livres qui ont fait la France – puts into question the dominant literary tastes in contemporary France. Chavdar Mutafoff (1889-1954) is one of the major personalities of the Bulgarian avant-garde during the 1920s. His articles on the modern art of that time still impress with their relevance concerning the artistic debates in the milieus of the European avant-garde. The text discusses the experience obtained by Mutafoff in Munich in the eve of the First World War – the years marked by the activity of Kandinsky and the Blaue Reiter – as well as Mutafoff’s (im)possible encounter and participation in the avantgardemilieu. The retrospective exhibition of Kandinsky first shown in Munich is of special interest. Review of the book Cultural Front by Ivan Elenkov.